WELLINGTON, Fla. - Feb. 28, 2016 - Audi turned the tide on Coca-Cola in the second half, taking a tight win Saturday in the last quarterfinal of the 26-goal C.V. Whitney tournament. The game, which ended 9-7, was held at Lechuza Caracas. In the semifinals Wednesday and Thursday, Orchard Hill will face Lucchese, and Audi will oppose White Birch. Sugar Erskine and Gillian Johnston started out strong, pulling Coca-Cola forward. 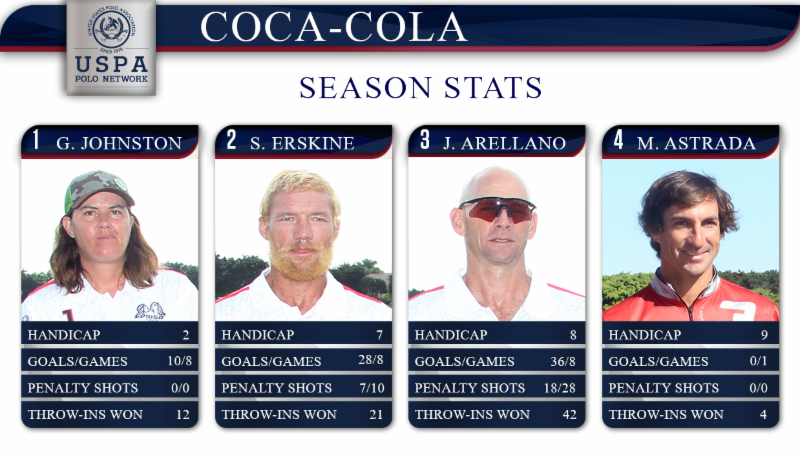 Erskine was ablaze, making three back-to-back goals total in the second and third chukkers. Coca-Cola played a sharply organized first half, maintaining discipline and not giving Audi much room. Then things changed. After trailing for three chukkers Audi suddenly poured it on, stopping Coca-Cola in its tracks. 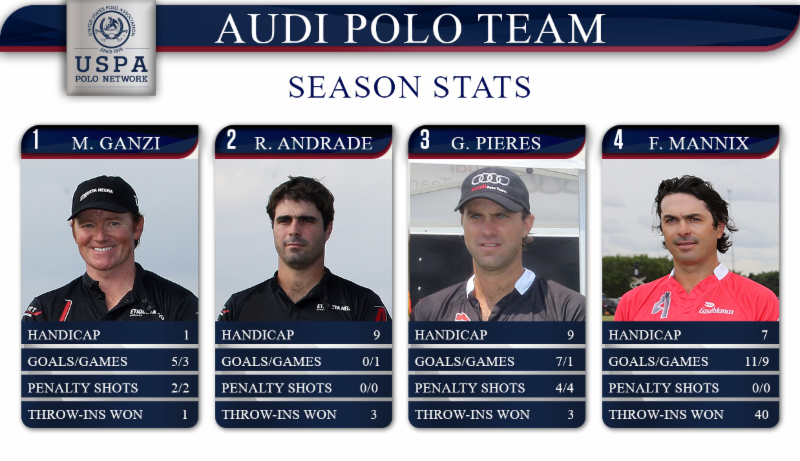 The team in red was scoreless in the fourth and fifth, while Audi made three goals in each of those chukkers. In the last 54 seconds of the fourth chukker Audi captain Gonzalo Pieres tied the game at 5 on a penalty 2, which was the first open goal penalty shot of the match. 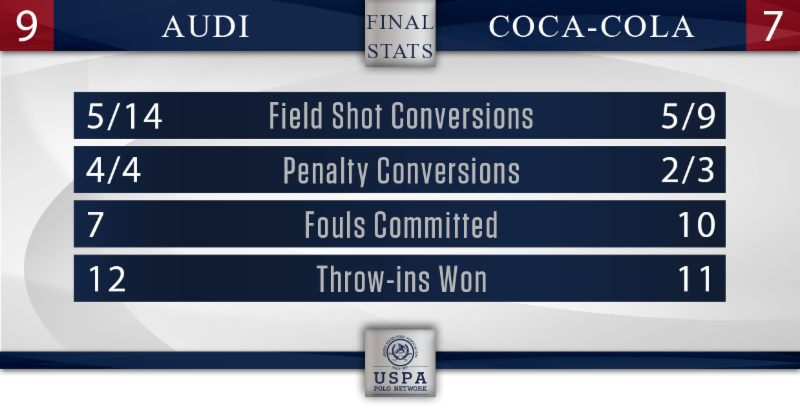 Until then Coca-Cola had played an extremely clean, heads-up game, giving Audi only penalty 5 opportunities. In the tent afterward Pieres (the game high-scorer with seven goals) and patron Marc Ganzi (who made Audi's other two goals) described the game as "the story of two halves." In a halftime powwow Audi decided to do two things: Be very tight with their men, and slow the game down a degree. The strategy, said Ganzi, was "to let Gonzalito dictate the pace, and when we found our spaces, then we'd run. We were running too much in the first half. We were running, running, running, he said with a laugh, "without the ball, which is the worst kind of running." The game was live streamed by ChukkerTV, a partner of the USPA Polo Network. Continuous live coverage of the Ylvisaker Cup semifinals, which were postponed due to weather last week, resumes Sunday, Feb. 28 with two games. The continuation of the Valiente versus Palm Beach Illustrated/Technogym game is set for noon at Valiente, followed by the 3 p.m. featured match at IPC (Dubai versus Orchard Hill). All times are EST.